CARFAX Certified 1 Owner - No Accidents - Fully Serviced - QUALITY CERTIFIED up to 10 YEARS 100,000 MILES WARRANTY This Mercedes-Benz includes: PASSENGER MEMORY Seat Memory DESIGNO WOOD/LEATHER STEERING WHEEL Steering Wheel Audio Controls Leather Steering Wheel PREMIUM 1 PACKAGE HD Radio Mirror Memory Navigation System CD Player Seat Memory Auto-Dimming Rearview Mirror Back-Up Camera AM/FM Stereo Adjustable Steering Wheel CD Changer Satellite Radio Auxiliary Audio Input Power Folding Mirrors Hard Disk Drive Media Storage MP3 Player CINNABAR RED METALLIC PANORAMA SUNROOF Panoramic Roof Generic Sun/Moonroof Sun/Moonroof Dual Moonroof RADIO: COMAND SYSTEM W/NAVIGATION HD Radio Navigation System CD Player AM/FM Stereo CD Changer Auxiliary Audio Input Hard Disk Drive Media Storage MP3 Player *Note - For third party subscriptions or services, please contact the dealer for more information. * A test drive can only tell you so much. Get all the info when you purchase a vehicle like this with a CARFAX one-owner report. The Mercedes-Benz M-Class ML 350 4MATIC - CARFAX Certified 1 Owner - No Accidents - Fully Serviced - QUALITY CERTIFIED up to 10 YEARS 100,000 MILE WARRANTY offers a fair amount of utility thanks to its advanced features and unique styling. It's also quite sporty, and injects an ample amount of handling chutzpah into the ridin'-high body of a family-friendly SUV. You appreciate the finer things in life, the vehicle you drive should not be the exception. Style, performance, sophistication is in a class of its own with this stunning Mercedes-Benz M-Class. Enjoy safety and stability with this all-wheel drive vehicle and drive with confidence in any condition. It's not often you find just the vehicle you are looking for AND with low mileage. This is your chance to take home a gently used and barely driven Mercedes-Benz M-Class. Take the guesswork out of where you are going with the top-tier navigation system found on this exceptional Mercedes-Benz M-Class. With complete records on this pre-owned vehicle, you'll have peace of mind and the satisfaction in knowing your new purchase is safe and reliable. Although this 2015 Mercedes-Benz M-Class ML 350 4MATIC - CARFAX Certified 1 Owner - No Accidents - Fully Serviced - QUALITY CERTIFIED up to 10 YEARS 100,000 MILE WARRANTY is technically a pre-owned vehicle, the clean and spotless interior could fool even the toughest critic. Unexpected repairs happen on all vehicles, but this Mercedes-Benz M-Class comes with the protection of the manufacturer's warranty. 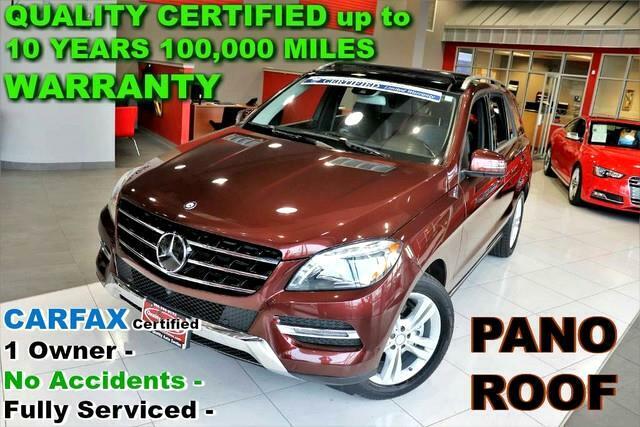 Fast and exciting, this Mercedes-Benz M-Class ML 350 4MATIC - CARFAX Certified 1 Owner - No Accidents - Fully Serviced - QUALITY CERTIFIED up to 10 YEARS 100,000 MILE WARRANTY is a true testament to the pursuit of automotive distinction by Mercedes-Benz. Once you're behind the wheel of this incredible machine, you will not think twice about purchasing this vehicle. There are options that you need, And there are options that you want. This Mercedes-Benz M-Class has them all. Added comfort with contemporary style is the leather interior to heighten the quality and craftsmanship for the Mercedes-Benz M-Class This car enjoys a laser-perfect paint finish. A perfect find to complement any rare automotive collection. This beautiful lass will turn heads everywhere she goes. More information about the 2015 Mercedes-Benz M-Class: The 2015 Mercedes-Benz M-Class is one of the most refined, most comfortable, and safest luxury SUVs available. It's also surprisingly fuel-efficient -- especially in ML250 BlueTEC diesel guise. The M-Class' interior has much-improved materials and detailing compared to the previous version, and it's now one of the most lavish cabins in its class. An off-road package for several different modes of trail driving is available and allows for ground clearance of up to 11.2 inches and a water-fording depth of 23.6 inches. The package also includes a locking center differential and a 2-speed transfer case. Interesting features of this model are plush luxury feel, good fuel-efficiency among sport utilities, Strong, smooth powertrains, comfortable seating for five adults, world-class safety technology, and quiet cabins No Credit / Bad Credit / No Paystubs, No problem !! ! All Approved ! Everyone drives ! CLEAN, GORGEOUS, LOW MILES, SHOWROOM CONDITION. CALL NOW QUALITY CERTIFIED up to 10 YEARS 100,000 MILE WARRANTY , To Certify a vehicle, there will be an additional cost for Certification. CALL NOW For details. STUNNING AGGRESSIVE LOOK ON THIS BEAUTIFUL--Call today to schedule a test drive... Good Credit/Bad Credit/No problem!!!! Get paid cash? No problem!! 100% Credit Approval with interest rates starting at 2.49% for qualified customers, our rates will not be beaten. We price our cars at wholesale price to guarantee the best deals for our customers. Our inventory moves quick, please call to confirm the availability of the vehicle of your interest Springfield location 973-564-0112. This vehicle is located at our SPRINGFIELD location. Come visit our new showroom in Springfield NJ. This outstanding example of a 2015 Mercedes-Benz M-Class ML 350 is offered by Quality Auto Center. The Mercedes-Benz M-Class is the benchmark all other SUVs strive to meet. With exceptional power, towing and handling, this SUV can handle anything thrown at it. Outstanding craftsmanship and artisanal refinements abound with this Mercedes-Benz M-Class ML 350. Take home this 2015 Mercedes-Benz M-Class and enjoy the safety and added performance of AWD. One of the best things about this Mercedes-Benz M-Class is that it has low, low mileage. It's ready for you to truly break it in. More information about the 2015 Mercedes-Benz M-Class: The 2015 Mercedes-Benz M-Class is one of the most refined, most comfortable, and safest luxury SUVs available. It's also surprisingly fuel-efficient -- especially in ML250 BlueTEC diesel guise. The M-Class' interior has much-improved materials and detailing compared to the previous version, and it's now one of the most lavish cabins in its class. An off-road package for several different modes of trail driving is available and allows for ground clearance of up to 11.2 inches and a water-fording depth of 23.6 inches. The package also includes a locking center differential and a 2-speed transfer case. Strengths of this model include plush luxury feel, good fuel-efficiency among sport utilities, Strong, smooth powertrains, comfortable seating for five adults, world-class safety technology, and quiet cabins No Credit / Bad Credit / No Paystubs, No problem !! ! All Approved ! Everyone drives ! CLEAN, GORGEOUS, LOW MILES, SHOWROOM CONDITION. CALL NOW QUALITY CERTIFIED up to 10 YEARS 100,000 MILE WARRANTY , To Certify a vehicle, there will be an additional cost for Certification. CALL NOW For details. STUNNING AGGRESSIVE LOOK ON THIS BEAUTIFUL--Call today to schedule a test drive... Good Credit/Bad Credit/No problem!!!! Get paid cash? No problem!! 100% Credit Approval with interest rates starting at 2.49% for qualified customers, our rates will not be beaten. We price our cars at wholesale price to guarantee the best deals for our customers. Our inventory moves quick, please call to confirm the availability of the vehicle of your interest Springfield location 973-564-0112. This vehicle is located at our SPRINGFIELD location. Come visit our new showroom in Springfield NJ.